Well, last night ended up being a rough one - as some of you guess from Facebook posts and tweets. It was definitely rougher for Jason than me though. After dinner he started saying he had been hurting and was afraid it was a kidney stone. He had one (or a few) four years ago. He had actually stashed the pain medication that they had given previously because he was so afraid of having them again. Yes, not supposed to take expired medication. But he was desperate, so he took one. Of course it had lots a lot of its potency so it wasn't kicking in. Finally, he admitted he needed to get to the ER. I know he was holding out because a trip to the ER is never enjoyable. But he was desperate and I could tell. I got us there in record time is all I'll say about my driving. Of course we had to wait, and wait...and continue to wait. Most people didn't look ill at all, except for one person who vomited everywhere and a wheezing infant. The whole time, Jason is still in pain, pale, shaking. It took probably 2 hours before we were taken back and at least another 45 minutes before he finally got an IV for fluids and some pain medication. We didn't get home until about 1 am. I don't know how I did it, but I got myself out of bed and made it to work 10 minutes early even. Though, I was a complete zombie and worried about Jason. He managed to get an appointment at his urologist today where they did a CT scan and evaluation. Of course, they couldn't really do anything to fix the problem. So, he's still hurting and I feel terrible because there's nothing I can do. After appointments and pharmacy visits, I forced myself to the gym. I wasn't planning anything over the top. I wasn't sure I'd last 10 minutes to be honest. But I'm glad I went because it did give me a little bit of an energy boost. And oddly, I felt pretty strong for the weights. I did supersets for back and shoulders as 4 sets of 8 reps with a dropset at the end. Let's just say the dropsets did me in. Already feeling this workout. Oh, and maybe the extra set I added in. Originally, I thought I'd be grilling out. But Jason doesn't have much of an appetite. So I went with something simpler, something that could be eaten at room temperature whenever he felt up to it. 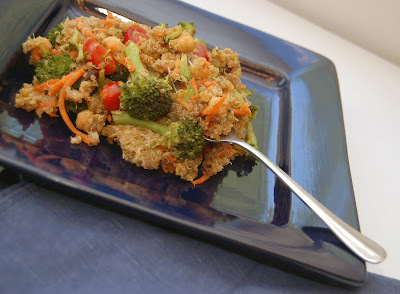 I sort of went with Moroccan spices as my theme for this quinoa salad. Cook quinoa per package directions. When there is approximately 3 minutes left, add in the raisins. Once done, remove lid and add in the spices. Meanwhile, steam your broccoli to desired tenderness. 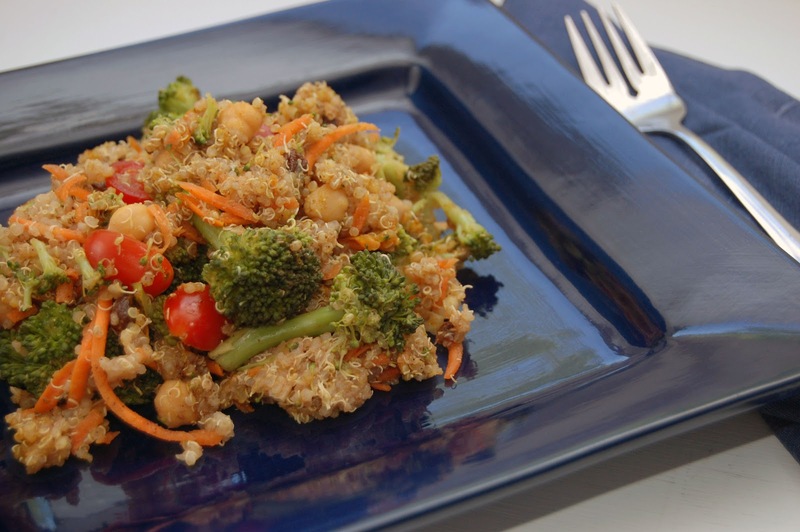 In a large bowl, combine carrots, tomatoes, and chickpeas. When the quinoa and broccoli are done, add them to the bowl. The heat/steam will help soften the tomatoes and the carrots. Mix well and re-season if needed. I was really pleased with how this turned out and how easy it was to throw together. The flavors are fairly mild and earthy. I think it would be fantastic with butternut squash or sweet potatoes as well. Of course, I think anything is good with either of those two veggies. So sorry for you and Jason. We can totally relate!